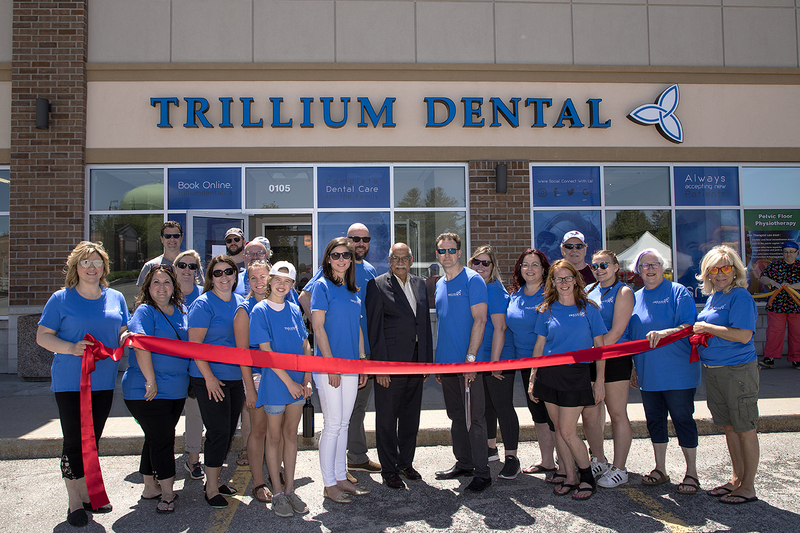 Ottawa, ON (June 7, 2018) – Trillium Dental ®, recognized as Ottawa’s largest name in dentistry, celebrated the grand opening of its newest dental clinic located at 1110 Carp Road, in Stittsville with a ribbon cutting ceremony on June 2, 2018. The opening of the Stittsville office marked the practice’s eighth location which also has dental clinics in Kanata, Nepean, Downtown Ottawa, Alta Vista and Orleans. Local residents and businesses, along with city officials, came out to welcome the new office to the growing community. Those who attended the grand opening celebration enjoyed refreshments, children’s activities, face painting, live entertainment, prizes and giveaways while receiving tours of the dental practice. From emergencies to walk-ins, Trillium Dental provides quality care to every guest through attentiveness, open communication and patient education. From its contemporary interiors to its modern technology and equipment, Trillium Dental is suited to create a unique experience for its guests. Trillium Dental invites new and existing patients, friends, neighbours and colleagues to stop by the clinic, meet the team and just say hello. The dental clinic is currently accepting new patients of all ages. Founded in 2001, Trillium Dental grew from one practice in Ottawa to eight practices across the National Capital Region. The first dental practice was launched with a simple mission: empower patients with the knowledge required to make an informed decision about their oral health. Trillium Dental remains committed to increasing awareness about the importance of oral hygiene and how it is beneficial to complete health – Because Your Mouth Says It All. The business was founded upon the philosophy of providing premium services, a respectful healthcare environment and dedicated professional team members with an unparalleled commitment to their patients and community. Trillium Dental provides a broad range of services, including general, cosmetic and restorative dentistry.